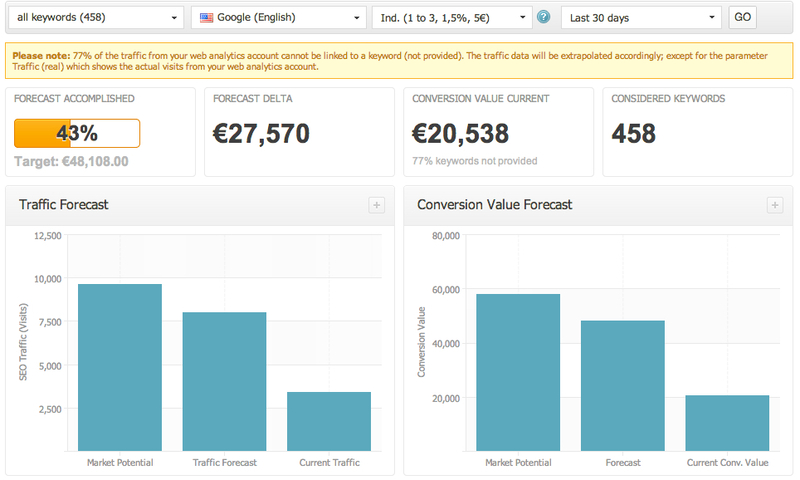 I am very proud: With the newest release of Search Metrics Suite, we have raised the bar for search analysis software. In short, we make the value of an investment in search engine optimization important, measurable and understandable for management in a way Warren Buffett would want. While others talk about the sense or nonsense of visibility in the search engines, we have simply worked to develop better metrics for online marketers with the next generation of search analysis software. What we’ve come out with is a new way to optimize search. Search Engine Optimization: The Search Metrics Suite now offers the ability to view the impact of rankings on your shopping carts, sales revenue and traffic plus understand your market share making SEO very tangible. But lets start at the top: First of all, we understand that the visibility of a keyword as a single value is not sufficient. Visibility is an important element to compare along with competitors and in identifying potential. And that’s just the beginning. No matter wether or not your a big business or national or international, there are other factors coming into play. Therefore, our first step was to take your keywords and place them into relation with the market. Our goal is to show you what your share of the market really is so you can measure your success and see what potential is waiting for you. This not only helps in understanding the value of a company, it is also a way to detect its position for groups of keywords and individual keywords. 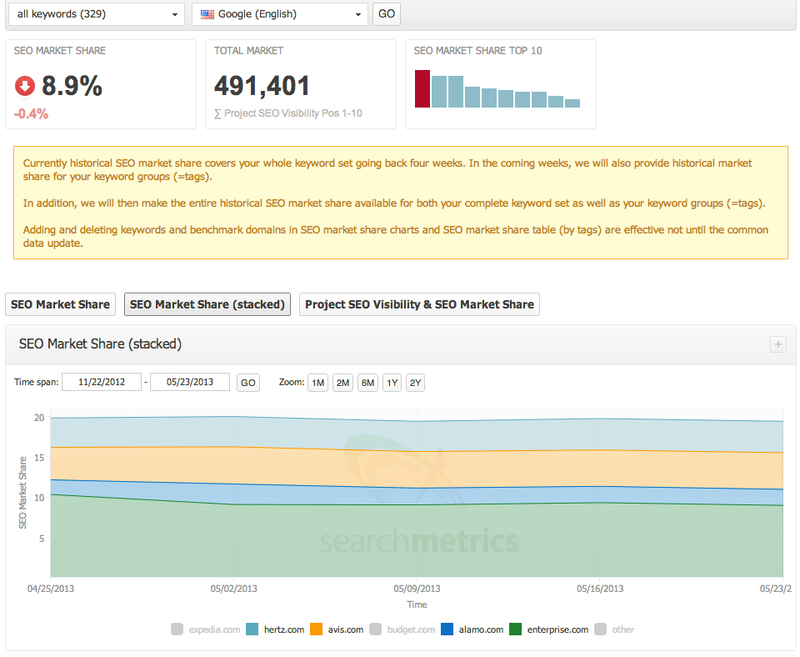 Once the relevant market is shown as a project you can view your current position in the SEO field. Our first new metric in the release: On the basis of the keywords you input, we show you how successful you are in the individual market. The following graph shows the percentage share of the market you’ve already achieved not your visibility. Once you have defined the best market for you, you can always continue to improve by adding new keywords. It’s important to be aware of strong keywords as they fluctuate in the market. Over a long period of time new keywords visibility can begin to fade. Unattractive spikes can also occur due to multi-keyword use in a market. But by determining a well defined market, you can see strong metrics to better understand your SEO market. In the following chart you can see the market share for its defined benchmarks and the remaining market share. In the second chart you can see the top 10 players and the rest of the market share. Both charts tell a lot. In the first you can see how much market share you and your competitors have and how much is still “left”. In the second you can see how much market share the top 10 players have. In a very long tail market the top 10 frequently have only 20% or less in a competitive market. In a short tail market with the keyword finance as an example, the top 10 occupy 80% of the market. This of course assumes that your keywords are your market – but that should be the case anyway. A great aspect of this, is that at anytime you can add keywords to your keyword pool making the curve of the Market Share more accurate and detailed – thus increasing overall visibility. In short, you can see who your competitors are and have a proverbial view of which deprives your strategy for gaining a larger market share. This is by far one of the greatest features we have ever built into a new release. At the end of the day we understand that its not about the market share, but about the sales that come from search engine optimization. Sales are key! And getting them by traffic equates to conversions. Many factors play a role in getting to the calculation of a conversion and the position in the search results is only one value of many. We now give you the ability to monitor more values in the Search Metrics Suite. When it comes to traffic, of course, the link to a SiteCatalyst or Google Analytics account is necessary. In the project wizard you define the target position and then the conversion rate and the conversion value. And now you can see at a glance how much you have already achieved of your goal. An important note, we consider in our calculations, the ratio of “Keywords not provided!”. One thing thats not include in most other tools. 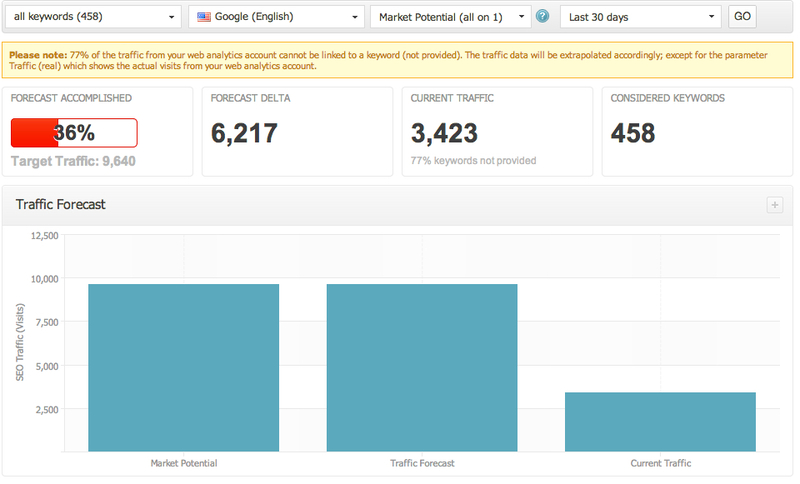 The left bar shows the possible traffic for your keyword pool or the full market potential. The right bar shows your current traffic and the middle bar is the result of your forecast. Prepared with some calculations we show you how realistic this is for the keywords and rankings selected. For example, with the “ambitious Forecast”, this tells you how much traffic is to be expected when you rank on Google for all your keywords between position 1 and 2. This is basically a mixed calculation because it is highly unlikely to rank with all the keywords on spot one. The 1-up forecast also shows you how your traffic increases if any keyword moves up one position. As a marketer this is a great benefit of knowledge when planning ahead. Who wouldn’t want to have this kind of insight? The Conversion Value Forecast, is what to expect for increased revenue. As a business understanding what increasing the traffic to your site means is vital. You want to know not only how much traffic your SEO campaigns can bring in the future, but additionally how much you will increase in sales. And of course by forecasting ahead of time, this helps in justify the SEO budget and the importance of SEO to management. Various studies have shown time and time again, campaigns without definition of objectives are usually less successful than those who have created a detailed forecast. By forecasting and setting goals on your activities you can measure your real success. We get a conversion with the integration by going deeper into your business metrics. Again, it’s about your achievement – but YOU are defining what goals are important to you. What I mean by that? For some businesses the number of orders or the checkout maybe the focus, but for others this is not the case. Because you have defined the goals this does not have to directly relate to a shopping cart based businesses. It varies based on the business model to suit anyones needs. For this, we combine the search data with your goals: In the project wizard you define the conversions and with your web analytics tool you can see the impact. You can also set this for future conversions with all other metrics to see how the rankings have a real impact on your cart or checkout showing your revenue. And what is even more important, is finding hidden keywords has become much easier. Besides the increased search volume you want your key phrases to be optimized and have a real conversion behind them. You can do this by adding a filter and show only the keywords in a certain threshold (position 11-13), that have a decent high search volume that converts well for your business model. These keywords can now be properly prioritized in gaining conversions. 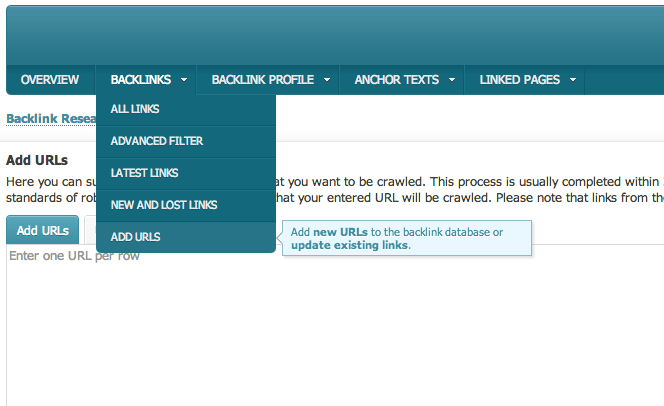 And last but not least, a “small” improvement of the existing analysis on our Link Management tool: In the backlink area you can enter your own URLs and within 24 hours we begin to be crawl them. This improvements allows us to monitor all of your links giving you the full picture and notifying you when links are deleted so you can take care of it. SEO has long outgrown its infancy. As performance marketing continues to become increasingly important, we at Search Metrics want to give the market with the best platform. We pack more and more elaborate technical features into our development while providing understandable, actionable, visual and business KPIs companies can leverage. We help companies understand the management of SEO and social – essentially helping them speak “SEO”. Your software is simply fantastic. I wonder how many people out there get sucked into thing that seomoz is the only way to go? I didn’t realize what you guys offer is so serious minded. I think many of us get so tired of SEO analysis that is promoted with copy that looks for guys/gals that are thinking at the lowest common denominator that we forgot there are other serious-minded options out their like your new Search Metrics Suite. Thomas, SearchMetrics is a powerful tool and if you guys keep improving, it will be used by more and more companies and SEO. Thank you very much for sharing with us this information! This is a really great news. I’m for the first time on this blog and I’m really surprised by the things I have the honor to read. Regarding to topic I must say that we must make search engine optimization important, measurable and understandable for any manager because sometimes is really difficult to deal with old habits. Thanks for all the help! You are setting the bar, as you say! I hope you keep doing that and you’ll always be this reliable.